Soundman is an audiophile-grade digital RCA cable capable of producing a more smooth and organic sound. XLR version also available. Ecosse Soundman RCA Digital Cable is for audiophiles with reference level 2-box transport and DAC CD/SACD system, or videophiles who wish the ultimate level of detail and resolution coupled with astounding low-frequency sonics. The Soundman propagates a full bandwidth signal within an ultra-low noise environment that ensures the most accurate signal transfer possible and represents Ecosse’s ‘statement’ digital transmission product. It is vital that ‘reference’ quality digital cable closely matches the ‘characteristic impedance’ 75Ω of the digital signal. The capacitance must also be kept as low as possible. The topology of Soundman is carefully controlled to precisely match these required specifications. It is a precision 75Ω cable designed to provide the highest quality single-ended digital interface and of especially low capacitance. 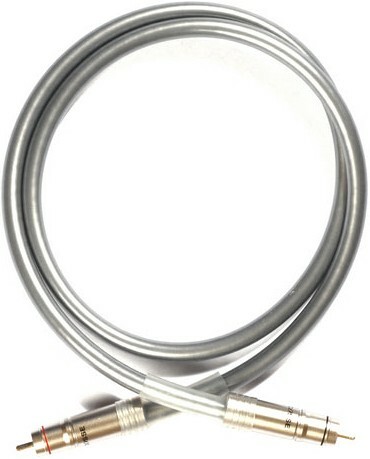 The signal conductor is made from a perfectly circular solid wire of 6N’s silver. Ultra-low-loss Foamed Polyethylene forms the dielectric insulator and the former for the first two of three screens. A pure copper foil is surrounded by a close-lapped braid screen of silver-plated Ultra-Hi Purity OFC. A layer of PTFE (Teflon) separates this screen from an outer screen of the same close-tapped silver plated UHP-OFC. Such a screen combination fully protects the digital bit stream from the distortions introduced by RFI, EMI and ESI ‘noise’. It is necessary and appropriate to ground this type screen at ‘source’ only for maximum noise reduction. A layer of Neoprene, acting as a damper and vibration absorber is sandwiched between the outer screen and the soft PVC outer jacket. The plugs used to terminate this cable are the finest development of Ecosse’s RCA plugs, constant-impedance MACH3; the best, non-compressing plug available anywhere! Uniquely, their centre pins and conjugate bracket shields, designed to form a ‘Faraday Cage’ for optimum RF screening, are both deep silver-plated Monocrystal Copper. The contact surfaces being thoroughly cleaned and treated prior to the application of Ecosse lead-free SuperSolder- a new ultra-high purity silver and tin alloy wire, together with unique, passive organic flux, ensuring a joint with vanishing low resistance, ultra-low chemical contaminants and very high strength. Tighter tolerances have improved the fit offering a lower impedance, gas-tight connection, a greater level of RFI/EMI/ESI noise rejection and a more linear and extended frequency transfer characteristic with negligible-no jitter contribution. All these factors contribute to a performance, which basically means that the signal at one end virtually equals the signal at the other end. In the interests of the most accurate signal transfer with lowest noise ingress and since capacitance increases with length, Ecosse recommends that 'The Soundman' be kept as short as possible. The terminations are part of the transmission path and therefore vital to it. Where a digital signal is concerned, the audio industry has set a standard of 75ohms but this can be severely compromised by poor, compressing RCA plugs that grip the cable with a grub screw or a collett action. The cable loses its integrity and the impedance can drop to somewhere in the region of 35 Ohms resulting in reflections and deletions. Ecosse's newly developed unique non-compressing constant impedance MACH3Cu deep copper or silver plated over copper RCA plug uses a centre pin and conjugate bracket shield which together offers away and return paths for the audio signal. To maintain continuity and optimum conductivity, these contact points are made from Monocrystal copper - same as the conductor wire itself- which are then direct hard silver plated. The plug casing is precision machined from highest quality copper alloy and is deep-plated. This thick casing offers further shielding effectively a second 'Faraday Cage' and reduces the ingress and radiation of EMI, ESI and RFI 'noise' even further, to virtually zero. The interface of shield and casing is one of high mechanical impedance, dissipating energy and rendering microphonic effects negligible. The full assembly represents Ecosse's Audiophile Grade RCA termination and the Ecosse MACH3 RCA is arguably the best available price wise, electrically, mechanically and aesthetically - anywhere!